On January 27, 2010, Cassini approached to within 13,000 kilometers of Aegaeon, the recently discovered moon that is now believed to be the parent body from which Saturn's dusty G ring is built. The 17 images in this animation have been cleaned of some of their cosmic ray hit artifacts and have been enlarged by a factor of two. A better estimate of Aegaeon's size will probably be the most important result of this observation. This little animation cycles through 17 narrow-angle camera frames that Cassini captured on Aegaeon, which flicker because they are taken with different exposure times and through different filters. The moon appears longer and skinnier in the first shots and rounder in the last ones. I would guess (but don't know for sure) that that means that Cassini was closer in the first frames, and saw Aegaeon at a higher phase (half moon like), and farther away in the last frames, and saw Aegaeon at a lower phase (more "full"). The science team will be able to do crafty tricks with these images to arrive at a decent model for Aegaeon's shape and size; I'll keep my eyes peeled for published numbers! The bright dot in the center of this image is the tiny (about 500-meter-diameter) moon Aegaeon, the parent body of the G ring. 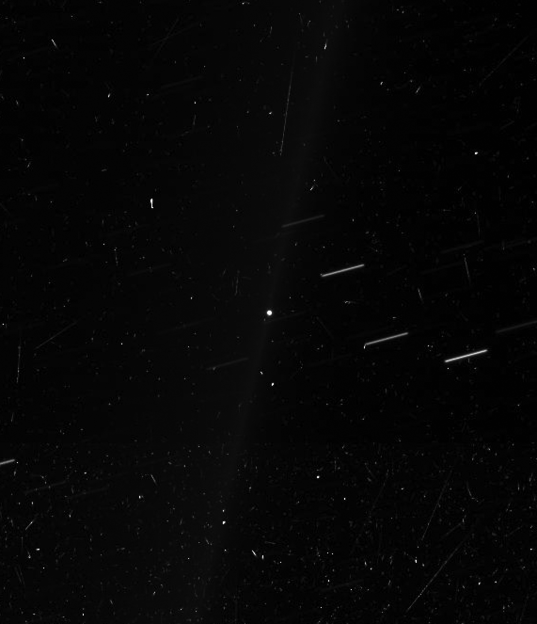 The G ring, which is composed of dust knocked off of Aegaeon by meteorite impacts, crosses the image from top to bottom. Long, nearly horizontal streaks are background stars, elongated into trails during the long exposure. Randomly oriented spots and streaks are cosmic ray hits, which decorate all Cassini images but are especially noticeable in long exposures taken while the spacecraft is buried in Saturn's radiation belts. 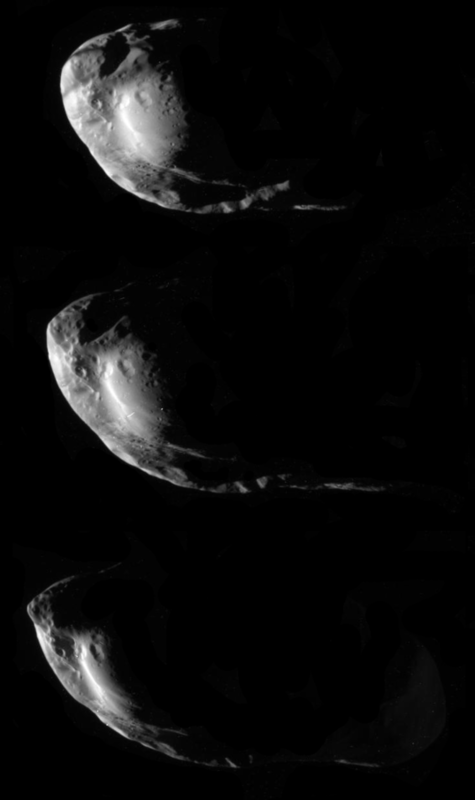 The Prometheus images were taken from about three times the distance of the Aegaeon photos, but Prometheus is much bigger than Aegaeon (about 119 by 87 by 61 kilometers in diameter). Here are three clear-filter views. 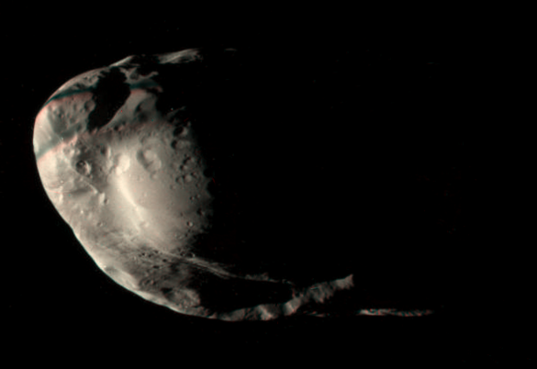 It's fun to compare these to the other high-res photos that Cassini took of Prometheus just a month ago. But wait, what's that in the uppermost view? There's a stripe crossing Prometheus. It's even more evident in this color composite. It's not my best work ever on a color Cassini image, because I was in a bit of a hurry, but it's good enough to show something really cool. There are some color fringes in the image where the individual color frames do not align properly. Some of this misalignment is due to Cassini's and Prometheus' relative motions and Prometheus' rotation. A separate issue causes the two rainbows crossing Prometheus' sunlit disk: these are shadows from two tendrils of the F ring, which moved across Prometheus' face in the time separating the images. Neato!! Visit the raw images website; there's more fun stuff to be had, including Enceladus plume images like this one, Dione closeups like this one, and red, green, and blue frames for a new true-color portrait of Saturn. This mission keeps on delivering great images, month after month!